Remarkably, they did not just attack, burn and pillage towns on the coast. Camagüey, which is in the centre of the island, was targeted so frequently by pirates in the 1600s that its street plan was devised like a maze to disorient them. Camagüey began life as the Spanish coastal town of Santa María del Puerto del Príncipe in 1514. It was relocated inland just 14 years later, ironically, not to escape the pirates but after battles with the local Indian population. Unlike almost every other Spanish colonial city, Camagüey is not built on a grid system with square plazas. Instead, to confound marauding pirates it has labyrinthine streets and narrow alleyways. Today there’s the added advantage that these twisting lanes keep out the tour buses and encourage tours on foot or bicitaxi (the Cuban version of a bicycle rickshaw). Among the pirates who sacked Camagüey was Sir Henry Morgan, one of the most notorious of all. Technically, Henry Morgan was not a pirate but a privateer. So, bear with me while I veer slightly off course to explain the difference. Pirates, most simply put, are robbers with ships. Traditionally pirates had no allegiance to any country or power, but were literally a law unto themselves. One of the most famous pirates of all times was Blackbeard (Edward Teach). Privateers were men with privately owned ships who were contracted by a nation at war to attack its enemies’ ships and in some cases towns and cities. Henry Morgan was contracted by the English who were at war with the Spanish at the time. Also operating in the Caribbean were the buccaneers. The word buccaneer originates from a word in the local Caribbean language related to dried meat—especially manatee. The original buccaneers traded this meat but eventually began attacking ships, especially Spanish ones, as well as raiding towns. Apparently it was a lot more lucrative. The lines between a buccaneer and privateer are very blurred. It’s also true that one nation’s hero is another’s privateer. Sir Francis Drake, for example, was lauded by the English as a legendary sailor and explorer but was detested by the Spanish who regarded him as a privateer and nicknamed him The Dragon. But, back to the ancient streets of Camagüey where Admiral Sir Henry Morgan once rampaged. They are now listed by UNESCO as a World Heritage site and were at the time of my last visit, the scene of an inadvertent luggage heist. I had had a group over-nighting in one of the town’s few hotels situated in the historic quarter. Because the street outside had been pedestrianised, this made shifting luggage in and out quite a mission. Porters had to load up trolleys and push bags through the crowded shopping street and load the bus at breakneck speed. Speed was crucial because the nearest access point was a narrow one-way road that would be temporarily blocked while this manoeuvre took place. The driver was always on edge because despite there being no alternative to this, the traffic police inevitably would descend waiving a ticket book. So, there we were poised to set off with the luggage when I noticed one of our bags was missing. As is often the case in countries where Latino male egos can run rampant, the staff first of all decided that either I hadn’t counted properly or I was responsible for the lost item. After putting those theories to rest, I tried to instill a sense of urgency among the front desk staff and the porters. I doubted the bag had been magicked away by modern-day pirates but it had to be somewhere. There had been two other groups staying in the hotel that night and both had already departed. “Maybe the bag was taken by another group by mistake,” I suggested. The staff all nodded and smiled. “Sí, sí, that is what happened.” Apparently that was case closed, so to speak. “So maybe I could see their rooming list and see if they had group members in rooms near my client?” I asked. The desk manager beamed. “Good idea.” He made no attempt to find the list. “So can I have a look at the list,” I said, trying not to let my voice go up an octave in frustration. Eventually we got the list and pored over it. I was sure now that bag was with one of two groups, one of which was doing a walking tour of Camagüey’s streets, the other was on the road, an hour ahead of us. “We need to ring their tour guides,” I said. Everyone agreed…and did nothing. “So can you find the phone numbers and call them?” I pleaded, only just refraining from bashing my head a few times on top of the reception counter at the same time. “I don’t have their numbers,” said the manager. I suggested he call their head office and ask, while wondering if it might be quicker if I vaulted the counter and did it myself. By now one of the porters had discovered a hitherto untapped vein of initiative and offered to dash through the streets to find the tour guide with the walking party. Meanwhile we’d discovered that the other tour guide had his phone turned off. The porter returned puffed and sweaty from his jog around Camagüey’s unique winding streets to tell me that the guide still in town had checked his bags and there were no extras. By now, our bus was waiting to be loaded so there was nothing for it, we’d have to hunt down the other bus en route. We hurtled east, the highway almost empty of other motorised traffic, our progress checked only by some prodigious potholes and corrugations and by the necessity of dodging around horse-drawn taxi carriages. The porter, who had now more or less admitted that he was responsible for the hijacking of one of my bags, was travelling with us and every few minutes kept trying the guide’s cellphone. The pressure was on as the coach ahead of us was due to turn off and head for Cuba’s northern beach resorts; we were not. There was one café at the road junction where the bag could be left, otherwise it would be off for a week’s sand and surf without its owner. Which is why we ended up at a police checkpoint, where the helpful officers kindly put out a call to stop the bus of unsuspecting European tourists and search for our bag. Luckily before they succeeded in flagging it down, the guide turned his phone on. He unearthed the bag and dropped it off at the café where we found it sitting beside the bar about 20 minutes later. The afternoon before the kidnap, we had taken to Camagüey’s streets in less dramatic fashion. Because the town lies outside Cuba’s main tourist trail, such as it is, you’re unlikely to meet many other visitors here. It’s an easy place to walk around (and to get lost in) but much more fun is to hire a bicitaxi on which to rattle around the cobblestone lanes. If you’re lucky, your bicitaxi might be equipped with its own sound system (ie ancient boom box tied to the back axle). The cyclists will take a rest, stretch out languidly along their bikes while passengers walk along the pedestrianised street leading to the Plaza del Carmen. A 19th-century church dominates one side of the square but what steals the show here is a series of bronze sculptures by Cuban artist Martha Jiménez created some years ago. The sculptor used local people as models. 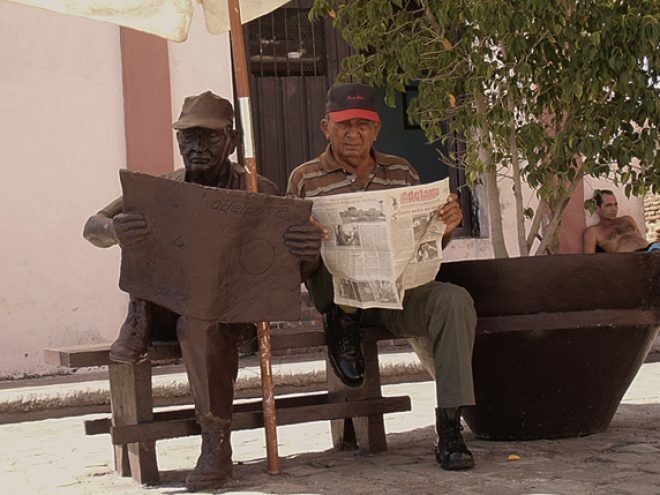 One of the sculptures is of a man wearing a baseball cap sitting on a bench reading the newspaper. Rather poignantly, the subject, now a little more lined and stooped, comes to the square to sit beside it, complete with cap and newspaper, waiting for tourists to make the connection. He’s been there two years running, which I find a little sad. I shamelessly cajole my group members to leave him small tips. With so little motorised transport here, even non-pedestrianised streets are claimed by Camagüey’s residents. In the late afternoon, as the sunlight softens, people spill out of their houses, most of which open directly on to narrow pavements. Old ladies sat on rocking chairs in their doorways, men leaned on walls and smoke cigars, boys kicked footballs over the cobbles and young women in skintight lycra wiggled past. I wandered around a corner and almost fell into a game of dominoes that had been set up in the road. A vocal audience surrounded the players as they slapped their tiles down on the table. Octuber 2014 This article formed part of the August 2014 issue of What’s On Havana The definitive monthly travel & culture guide to Havana Download our current issue of What’s On Havana, your definitive travel, culture and entertainment guide for all things happening in Havana, Cuba’s bustling and enigmatic capital city. We include features from around Cuba written by the best international travel writers covering Cuba. Our monthly online digital magazine is also available in Spanish and French.